We’ve had a bit of a run on sectional garage doors recently. If you have a limited amount of space on your drive, or no drive at all, then this garage door could be for you. Sectional garage doors are constructed of horizontal panels (usually between 3 to 8) which rise vertically, then glide horizontally back into the garage. Runners on the ceiling accommodate the horizontal panels as they slide into the garage. 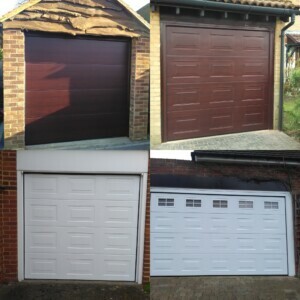 Sectional doors are usually fitted behind the garage opening. • Vehicles can park very close to the garage before opening as they don’t require any space outside. • They can offer a high level of heat and sound insulation. • There’s lots of choice in panel design, colour, paint finish etc. We think the ‘pros’ outweigh the ‘cons’! We are able to supply sectional garage doors from a number of manufacturers such as but not limited to Novoferm, Carteck and Seceuroglide.